What would you do if you learned about a neglected filly that needed help? 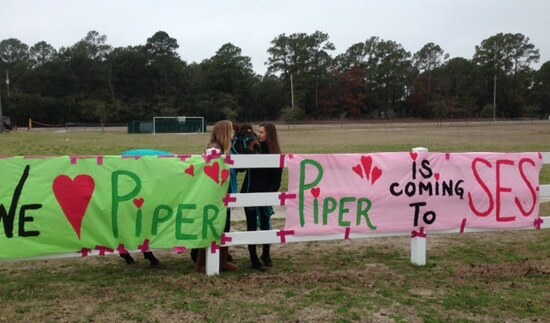 Students at Southport Elementary School in North Carolina, came together to help a one-year-old filly named Piper. The students first heard about Piper through one of the school’s physical education teachers, Donna Michaux. Donna had attended a conference where the table next to hers belonged to the Southeast Coast Region of the United States Equine Rescue League. Unfamiliar with the organization, Michaux began asking questions and learned that just a few months earlier volunteers had rescued a horse from Brunswick County. The horse’s name was Piper. This is Piper when she was first rescued. 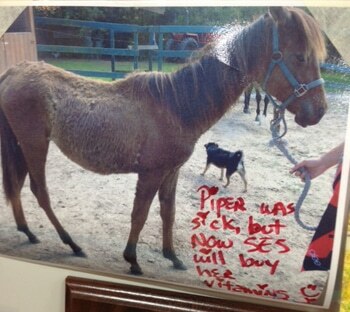 Piper, had been abused and neglected. At the time of her rescue, she was malnourished and too weak to lift her head. Infested with lice, she had severe skin irritations and open sores. 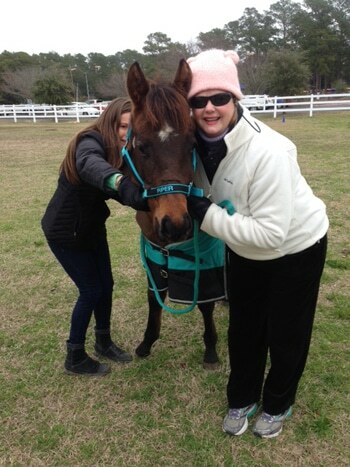 The volunteers explained that Piper was being cared for but she had a long road toward recovery. She would need special food and vitamins; the items were expensive and the organization runs on donations. Though she was near death, the rescue team at Poplar Grove Animal Sanctuary, where she was being cared for, was not ready to give up. Michaux asked how she and her students could help. The first thing she did was hold a drive to collect towels and blankets for Piper and the other horses at Poplar Grove. 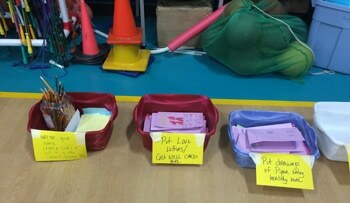 The students responded, bringing in so many that they were stacked along the walls of the school gym. Wanting to do more, Michaux organized a penny drive to buy the special food and vitamins Piper so badly needed. Michaux said she was overwhelmed by the students’ response. Students wrote love letters to Piper and drew pictures of her being healthy. During the penny drive, Michaux made daily trips to the bank so that there would be no charge to count the pennies. “I wanted to make sure all the money went to Piper,” she said. The school’s goal was to raise $1,000. The school collected pennies for Piper for 5 weeks. To keep track of the pennies coming in and how much money was being collected, students were asked to create a graph. 1. What is this kind of graph called? 2. What do the numbers on the horizontal axis represent? 3. How much money did the school collect the first week? 4. In which week did the students collect the most money? Why was there such a big jump in the amount collected? The school began showing pictures of Piper and her condition after the second week after the second week of the penny drive. In the early days after her rescue, she didn’t have the “spark of life” in her eyes and every day was depressing and painful. People were moved by the photos and wanted to give generously. 5. How much money in total did the school collect in the five weeks? 6. How many pennies did they collect in the first five weeks? Write your answer in word form. 7. How much more money would they need to raise to reach their goal? Piper in her new coat. Word of Piper spread through friends and family, some people wanted to help the students in their efforts, and everyone wanted to see Piper recover. One woman placed a bucket on her front porch, and submitted a notice in her community newsletter asking neighbours to drop off their pennies to help the students raise funds for Piper’s care. People responded and dropped off bags of coins for weeks. One day Donna received an anonymous donation. A woman living in the area had been widowed for about a year when she decided to take a trip. As she went to get her suitcases, she noticed they were unusually heavy and opened them. Inside she discovered $105 in rolled pennies! 8. There are 50 pennies in each roll. How many rolls were in the suitcases? 9. According to the US Mint, a single penny weighs 2.500 grams. How much does one roll of pennies weigh? 10. When the woman picked up her suitcases she described them as ‘unusually heavy.’ How much does $105 in rolled pennies weigh? The woman had heard about Pennies for Piper through the newsletter, and knowing that her husband had loved horses, she decided to donate all the pennies so the money could be used for Piper’s care. “It was almost like he [the widow’s husband] was coming from Heaven saying that he was still with her and it was time for her to move on,” Michaux said of the kind woman’s donation. After weeks of care, Piper is well enough to visit the school! Altogether $1,151 was raised for Piper’s care. In addition to providing food and vitamins, there was enough money to send Piper to North Carolina State University’s School of Veterinary Medicine where she received treatment for her skin irritations and wounds. 11. How much more money did the school raise than their original goal of $1,000? Piper’s vitamins cost $50 a bottle. The vitamins came in the form of a 2 inch square container with dried vitamins inside. Piper received two vitamins a day mixed in with her food. Each bottle of vitamins lasted a month. 12. At one point the school budgeted $350 for vitamins. How many bottles could they buy with $350? 13. How many months would they last for Piper? Piper is now on the mend and has a bright future ahead of her. She has been adopted and will go to her “forever home” next month. Teacher Donna Michaux says the fundraiser is one of the highlights of her career at Southport Elementary. It turns out that Piper is of royal bloodlines. Her dam is a famous race horse named Sleepys Dash, so Piper is a royal Princess and the granddaughter of a royal bloodline race horse, Dash for Cash. How do we know? 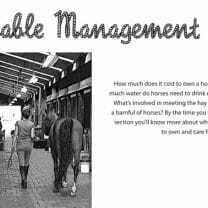 Horse Talk – dam: the horse that is the female parent. Piper’s dam, a quarterhorse who originally came from the same farm as Secretariat, was also at Poplar Grove Animal Sanctuary! She had been starved when she was first rescued. Volunteers found a tattoo in the mare’s mouth, and went to the Jockey Club in Lexington, Ky., to investigate further. All Thoroughbred race horses are tattooed with an identifying number on their upper lip. “There was a digit missing. The tattoo for the thoroughbreds is one digit greater than the quarter horses,” said Jo Weaver, one of the volunteers. Next they went to the American Quarter Horse Association (AQHA), and that’s where they discovered who she was. The mare’s name was named Sleepys Dash. 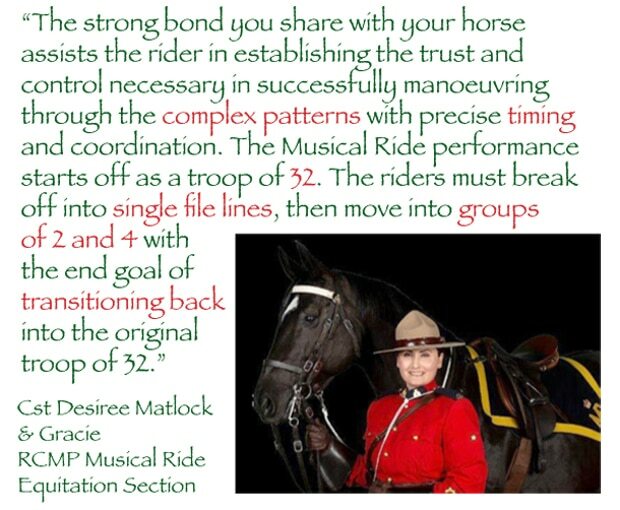 In an effort to construct Dash’s family tree, Jo became a member of the American Quarter Horse Association. 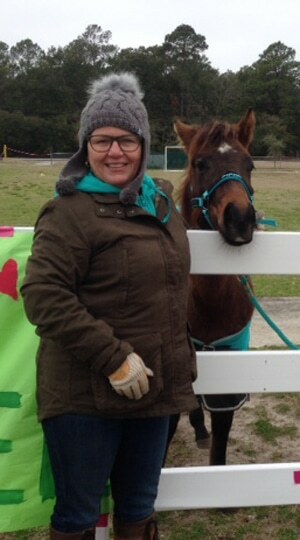 Jo had taken a special interest in Dash and had adopted her not long after she’d stepped off the trailer at Poplar Grove. Dash seemed to recognize Piper when they were reunited. “She started kissing Piper. She knew exactly who she was,” said Kitty Worthington, Poplar Grove’s project director. Where is Piper’s forever home? Well, it seems Jo Weaver is having a barn built big enough to accommodate not one but two new horses. Once it’s ready, Dash and Piper will be moved from Poplar Grove, and we hope, live happily ever after. Answer: The number of weeks. Answer: The school collected $50 the first week. Answer: The students collected the most money in the third week. 5. How much in total did the school collect in the first five weeks? Answer: $50 + $75 + $225 + $200 + $100 = $650. The school collected $650 in the first five weeks. Answer: There are 100 pennies in one dollar. 650 x 100 = 65,000. They collected sixty-five thousand pennies! Answer: $1000 – $650 = $350. They needed to raise $350 more. Step 1: Each roll = $.50, so 2 rolls = $1. Step 2: 105 x 2 = 210. There were 210 rolls of pennies. Answer: 50 (the number of pennies in one roll) x 2.5 grams = 125 grams. One roll of pennies weighs 125 grams. Answer: 210 (the number of rolls of pennies) x 125 grams (the weight of one roll) = 26250 grams. Answer: $350 ÷ $50 = 7. Three hundred and fifty dollars would pay for seven bottles of vitamins. Answer: This would be enough seven months. 3.NBT.A – Use place value understanding and properties of operations to perform multi-digit arithmetic. 4.MD.B – Represent and interpret data. All photos courtesy of Donna Michaux and the students of Southport Elementary School. I am the originator of Pennies for Piper. 🙂 We all LOVE Piper and to think she turned out to be a Princess from legendary royal horse bloodlines! 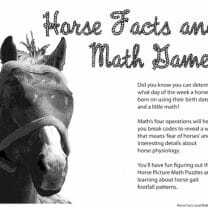 I was sooooooooooo excited to see a website all about horses and incorporating math. 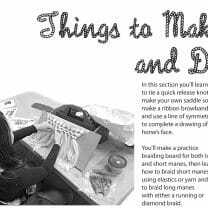 That is so unique and my hat goes off to all the students and parents that support such a fun and inspirational way to use math in real life settings. This network is just another level of the Piper Magic that keeps blooming and growing. And speaking of growing, Piper is on such a HUGE growth spurt from all the vitamins that my students at Southport Elementary School are buying for her. She was stunted at a young age with no food, water, and every day misery and pain. But, now she is pain free (we paid for the surgery to remove a huge wooden spike embedded in her tiny shoulder) and she is getting plenty of good food, water, vitamins, exercise, love and attention! Everyone can learn from Piper and if YOU eat properly, exercise, and take your vitamins, you can grow up strong and healthy as Piper. Piper is in a really nice home now and is reunited with her Mother, Dash. Dash recognized Piper right off and ran over to her and they touched noses and then Dash licked and loved all over her baby, Piper. 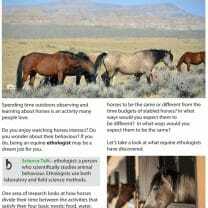 Horses know! They have thoughts and emotions too. Just read the article about Piper. I am her adopted Mom. She is doing well. Getting very sassy as an almost 2 year old filly should be. I will be taking Piper and Dash back to Southport Elementary School at the end of the school year so the children can see their remarkable progress. Dash was at least 300 pounds under weight when she came to Poplar Grove last summer. She has fully recovered. She is going to be in a show this summer to encourage people to look at rescues before buying. She is a looker. I heard a woman say a few weeks back that she had to be the most beautiful horse she had ever seen. I chuckled to myself “if only you could have seen her last summer.” The girls have become the center of my world. I do not know what I did with all my free time before I had them. Both seem to know they have a good life ahead of them. They will never be abused or go hungry again. Thanks for keeping the story going. It has helped the sanctuary. Awareness is key to our mission. Thanks for the update Jo! Wonderful to hear that she’s doing so well.